full-color map and timeline of Narnian history and black-and-white chapter opener illustrations.This edition presents all seven titlesâ€”The Magician's Nephew; The Lion, the Witch and the Wardrobe; The Horse and His Boy; Prince Caspian; The Voyage of the Dawn Treader; The Silver Chair; and The Last Battleâ€”unabridged and in C. S. Lewis's preferred order.In celebration of the 60th anniversary of The Lion, the Witch and the Wardrobeâ€”the book that first introduced readers to the land of Narniaâ€”this deluxe edition is a beautifully bound hardcover with elegant gilded edges and a ribbon bookmark, housed in a matching slipcase. 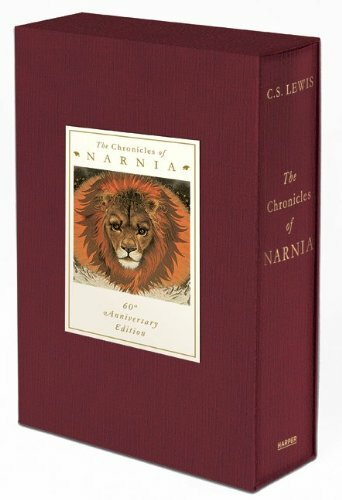 It features a full-color timeline of Narnian history and excerpts from Beyond the Wardrobe, which offers more insight into the characters, places, battles, and magic of Narnia. This edition also comes with a full-color map ideal for framing.